It turns out I’m not the only purse-appreciator who has noticed the similarity. Some have been calling it a knockoff, but I think it’s a legitimate inspired-by reinterpretation. I was also happy to find that someone else has basically written the blog post I meant to write, on the law of inspiration vs. piracy. According to The Fashion Law, the Innovative Design Protection and Piracy Prevention Act (IDPPPA) would permit this kind of reinterpretation. IDPPPA, introduced by Sen. Schumer of New York and endorsed by CFDA, was apparently reported favorably out of the Senate Judiciary Committee in 2010 but then languished; it has since been re-introduced in the House in the 112th Congress by Rep. Goodlatte of Virginia. I haven’t read and analyzed the bill(s), but the opinions on the Internet are, unsurprisingly, divided: one fashion lawyer/commentator I found thinks IDPPPA will only harm the fashion industry by adding burdensome litigation costs, and that originality standards will be difficult, if not impossible, to prove or enforce. This is not my area of expertise, but from what I’ve read and observed in the arena of art and copyright, courts are extremely ill-equipped to judge what amounts to original reinterpretation, fair use, or artistic appropriation. Since 2005 (and excepting only 2006), I’ve been making the yearly journey out to freezing Cambridge, Mass., to participate in the MIT Mystery Hunt as part of the Simmons Hall team. The Simhunt team changes names from year to year, usually loosely based on themes like waffles or sponges, in tribute to the peculiar architecture of the host dorm; this year, we were Enigmatic Porifera, which is an anagram for something relevant, I’m told. 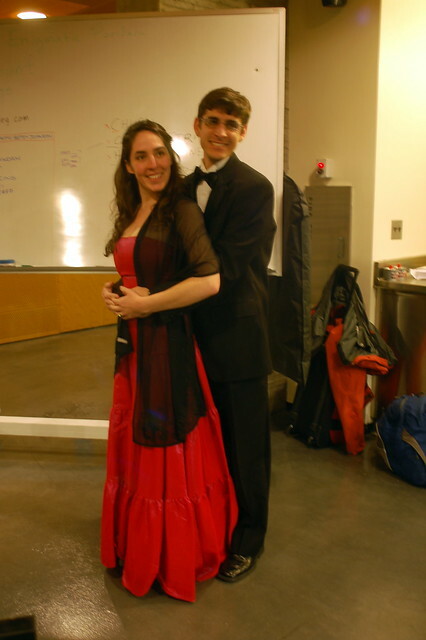 Amy and Bryan, two of our team's fearless leaders, reppin' for Enigmatic Porifera in all-out prom style for one of the events. There are lots of post-Hunt blog posts and reflections on the Internet (chiefly on Livejournal, for some reason), so I won’t rattle on it about it for too long. The Google+ page is a great resource for finding documentation and what others have been posting on the Hunt. For example, the G+ page helped me find this nice essay on puzzling and the scientific endeavor. This year, like last year, our team was quite small. I’d say we had a core team of about a dozen to 20 solvers, including one remote participant (who was a total rockstar solver). With this small group, we were still able to finish #14 out of 33 teams in terms of total number of puzzles solved [PDF]. In contrast, our performance on the metas [PDF] was quite poor: we only ended up solving 3 (out of 12). Of course, the crucial metric of how much fun we had again went unmeasured, but I think we were definitely at or near the top of the pack. It seems like a good conclusion with regard to improving our team’s competitive performance overall would be that we need to focus on improving our meta-solving ability. Of course, the trick is that we have to get fast enough at solving the non-meta puzzles so that we have a few solutions to work with. I suspect that much of what makes the perennially-competitive teams perennially competitive is that they have a larger, deeper pool of solvers at their disposal. Teams like Codex, Manic Sages, and Metaphysical Plant seem to field about 70-150 members each year, including large and effective remote contingents. In contrast, I think we might have had 50-70 puzzlers at our membership peak, maybe 2007ish, which was not to mean that we ever had 50 people working on solving puzzles at one time. 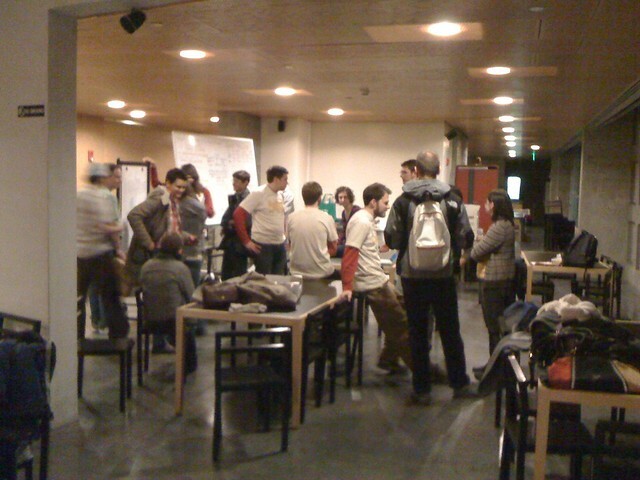 Our team, post-Hunt in 2010. Since our team works out of Simmons Hall, which is a bit remote from the rest of the puzzling action, my teammates and I usually hadn’t had much interaction with the other teams. There was a bit of drama a couple of years ago when some of our stronger solvers left for a more competitive team, but otherwise, the other teams were a complete mystery to me. This year, I had a friend from Dartmouth who wound up doing her first hunt with Metaphysical Plant – a giant team that put on 2011’s excellent hunt. We got to meet up with her and some of her teammates afterwards and talk to them about how their team works. We learned that they have a pretty solid web-based puzzle productivity/management interface for their team, at least some of which was coded on the fly by a team member at the start of the Hunt. Our team just uses a cascade of Google Docs (back in the day, we had a home brew MediaWiki installation which was probably more trouble than it was worth since many of our solvers weren’t super comfortable with wikis). As result, Jon resolved to work on some kind of web application that should at least theoretically boost our puzzling productivity next year – we’ll see what happens. Both “March Madness” and “Pacific Overtones” called on my hazy memory of things I sort-of learned as a child at Chinese school, which was fun. The law nerd in me was super excited when I opened up “Tax… in… Space,” but sadly, it was about 3 in the morning at the time, and I didn’t have enough remaining cycles in my brain to tackle it. I am pleased, however, to learn that the puzzle was authored by a real live lawyer/law professor! I haven’t looked at the solution yet because I’m still hoping to take a crack at it later. We totally dominated “Potlines” and “Incredible Edibles,” which is a true testament to the cooking/food obsessiveness on our team. But I will confess that I am still disappointed that “Potlines” was not about stoner movies. “Revisiting History” was interesting to me until we quickly figured out it was a Dr. Who puzzle, then I got up and walked away. There’s no accounting for taste. Someone else who knew/cared about Dr. Who solved it later. It’s funny how a theme – and not even a substantive theme – can drive or repel your interest in a puzzle. Anyway, all in all a wonderful time, and, like last year, am already resolving to practice puzzling more in the interim and already looking forward to next year! 100 hours of juice fast. So, perhaps unsurprisingly, we broke the juice fast a little early. We aimed to go for one week, but stopped after four days. The main reason, if you’ll believe us, is that we were bored. Eating good food is one of the most important and interesting parts of our lives, and fruit and vegetable juices just don’t provide the same variety of tastes (and, of course, textures) that we require to keep ourselves entertained. Juice fasting is also kind of a damper for your social life, since (at least for us) socializing often revolves around food. We even had to skip out on Jon’s work’s holiday party, since we didn’t want to stand around and just watch people eat and drink. 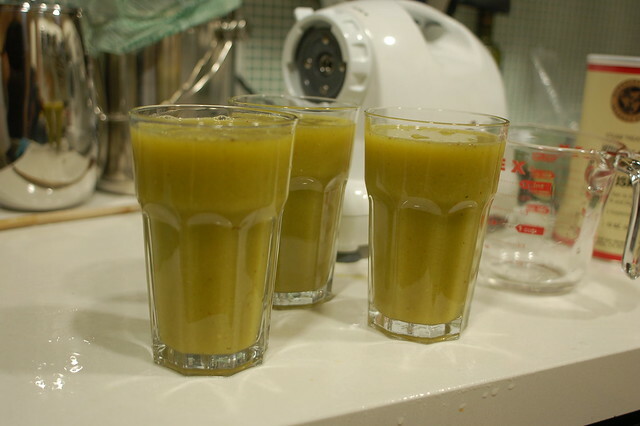 Otherwise, juice fasting turns out to be pretty easily doable. Aside from the boringness of it, the other main issue was simply dealing with hunger. For the first two days, I was hungry a lot of the time, and that was just an unpleasant sensation for which I had not been prepared. After the second day, I wasn’t hungry so much, and my appetite seemed significantly decreased. However, I never experienced any of the detox effects – extra energy, clarity, etc. – that many people claim to get from juice fasting. Instead, I had a lot of hunger at first, and then I was just easily tired and constantly cold. I also didn’t seem to get any great cleansing in the digestive department. I took one tablespoon of psyllium husks each morning, thinking that the added fiber would help keep my digestion regular, but it had little effect for me. In terms of weight loss, Jon and I each lost about five pounds in four days. For me, and if our scale is to be believed, most of that was fat. Since we started eating solid food again in the past couple days, I’ve gained about two pounds back (again, fat). Everyone warns you to be careful about breaking your fast, and ease out of it with small amounts of plant-based foods. We thought about that, but then threw caution to the wind and went to our favorite taqueria to eat quesadillas and crispy nachos. Then, I got a terrible headache and felt horrible. So I wouldn’t do that again. But it does seem to be the case that my decreased appetite is sticking around — even four days after breaking the juice fast, I’m definitely eating smaller amounts of food than I was before. Considering that self-control in the quantity department is probably my biggest challenge in terms of eating healthily, that seems like a pretty good payoff for the effort I put into juice fasting for four days. 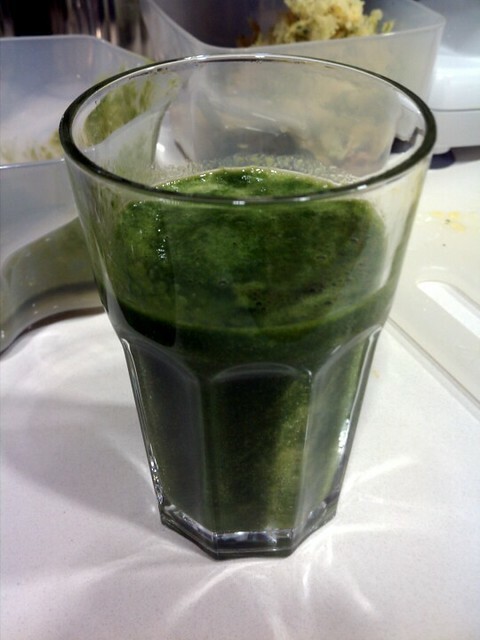 I might try juice fasting again in the future, and/or just substituting a juice for a meal once in a while. If I do a full-on fast again, I will probably try to do more research in preparation, since this time we just kind of intuited our way through, with a little help from Google. It was definitely a great way to efficiently consume a lot of fruits and vegetables. I do highly recommend the juicer we got, the Omega J8004 – it was easy to use, easy to clean, take apart, and put back together, and worked well for everything we tried putting in there. Apple juice is bad for you. That’s the conclusion of the Associated Press, which blames high calories, not dangerous arsenic levels. All the more reason to prefer cider, right? Regardless of the dangers of juice, Jon and I are embarking on an under-prepared foray into juice fasting, inspired by our recent watching of the documentary Fat, Sick, and Nearly Dead (which is currently free to watch on Netflix or Amazon Prime). We’ll see how long we last. I’ve noticed I’ve been feeling almost constantly hungry for the past couple days, ever since we put in our order for our new juicer, in anticipation of the coming deprivations, I guess. The problems of libertarian futurism. The Thiel Fellowship website reflects a more nuanced view, to a certain extent: the site’s page on “the education bubble” focuses on the unethical burdening of young people with untenable student loan debt. I think that’s a very legitimate public policy concern, but of course, it does not follow that everyone should skip college and launch high-tech startups. All of the identity-related things are in my mind much more nuanced. I think there is a gay experience, I think there is a black experience, I think there is a woman’s experience that is meaningfully different. It’s nice to see an example of an ideological libertarian observing and learning something about the reality of the world we inhabit. However, it’s less inspiring to see Thiel shy away from issues, like energy policy or climate change, with live political implications – it seems like he just thinks political problems are too hard. To say, as he does, that “it would be good if we had a less political world,” is like saying “it would be good if we had a less money-driven world” – it’s an impossible utopia. But the failure to recognize that we live in an observably more money-driven world than a politics-driven world shows a shocking disconnect from reality which is, in my view, the fundamental problem of libertarianism. (Is that a real story? Or shall I write it?) Note also, of course, that in the Star Trek universe, the Federation has progressed past currency, making “entrepreneurship” obsolete. Apple’s Siri is anti-choice and pro-breeding. Despite what you might have read, Apple’s virtual assistant iPhone program, Siri, is not “pro-life”, and no one is accusing it of such. * Instead, Siri is simply obfuscatory, with apparent anti-choice biases. The last couple of links address some of the gender- and reproductive freedom-based reasons that we should care about Siri’s poor response to abortion inquiries. Another angle, apparently lost on, for example, Ars Technica commenters, is the net neutrality angle. I was pleased to notice that Sen. Blumenthal, of my home state of Connecticut, has already addressed this. In conclusion to this footnote that has overwhelmed the blog post, words matter, and people who write for a living should be a little more careful when using them. The brick and mortar opticians’ cabal. You can also try to walk into an optical shop and ask for a PD measurement. In the past, most optical shops provided PD measurements for free, but now we’re finding that many are no longer doing so in a vain attempt to maintain control of the market and prevent people from buying online. In the end, I wound up paying $25 for the optometrists-in-training at the UC Berkeley Eye Center to measure my PD. I guess they’re more of a medical school than a member of the brick and mortar opticians’ cabal, so they don’t really have a dog in this fight. It owns LensCrafters, Pearle Vision, Sunglass Hut, and the optical shops in Target (TGT) and Sears; (SHLD) it owns Ray-Ban, Oakley, and Oliver Peoples; it manufactures, under license, eyewear for more than 20 top brands, including Chanel, Burberry, Prada, and Stella McCartney. “They’ve created the illusion of choice,” says [Warby Parker co-founder] Gilboa. And inadvertently they’ve created an opening for an indie anti-brand brand such as Warby Parker. Luxottica declined to comment. …Warby Parker uses the same materials and the same Chinese factories as Luxottica. It can sell its glasses for less because it doesn’t have to pay licensing fees, which can be as much as 15 percent of the $100 wholesale cost of a pair of glasses. Warby Parker doesn’t have to deal with retailers, either, whose markups can double or triple prices, it says. And at least for now, the founders are content with lower margins. So, Warby Parker and co. are full of win, right? They simply seem to have the superior business model; if the market works at all, then surely the pathetic and apparently-coordinated attempts at Luxottica outlets to resist progress through noncooperation will ultimately prove futile. Well, I’m not as optimistic about the market as some, but we’ll see.